It took looking at this picture awhile before I could see what was going on. It reminded me of some of the obscure art installations I’ve seen while traveling. – I feel like that sometimes. 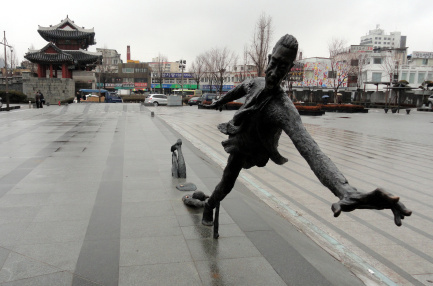 – That sculpture thing there – the legs in the pavement, the guy jumping out. – When I travel – I feel like I jump through the earth and pop up in some new place. I feel disoriented, fragmented, not quite myself. – You come up with the strangest thoughts. By the way, where are we again? – I don’t know – check your itinerary. Somewhere in Japan, I think. – Huh. Right. Day 5. Look at that temple! This entry was posted in Flash Friday Fiction and tagged flash friday. Bookmark the permalink. I hate organised sight-seeing tours, and you’ve captured the relentless schedule here beautifully. One sight after another and in the end it all merges into one… Well done. Like what Sandra said organized tours sort of ruin the feel of things and cheapens the place sometimes. I felt exactly that way when I went to Egypt so many years ago. You’ve captured that beautifully. Well done. I’ll echo. I felt the same way in Israel. Too much guided tour. Well written. I could relate to your MC’s disorientation. I have felt like that myself. Way back in the day, I saw a movie (don’t remember anything about it other than the sense of hurrying) called “If it’s Tuesday This Must Be Belgium.” This reminds me of that. WOW!! It seems you took a very closer look at the picture and wrote it really very well..
Will you plz find osme time to read my short sromantic story? plz..
your dialogue here is great. I couldn’t figure out what was going on in the picture until I read some other people’s stories, lol. I love the dialogue; it’s pretty snappy. “By the way, where are we again?” I want to scream at her/ him to pay attention. Great dialogue and mood. A very imaginative interpretation of the prompt Erin. I liked the image of ‘popping up’ in a new place. well done. with the alternating dialogue, only two people, names aren’t necessary, so you saved words. good. however, you can use the hyphen for one, not use it for the other, to differentiate. although it wasn’t difficult anyway.